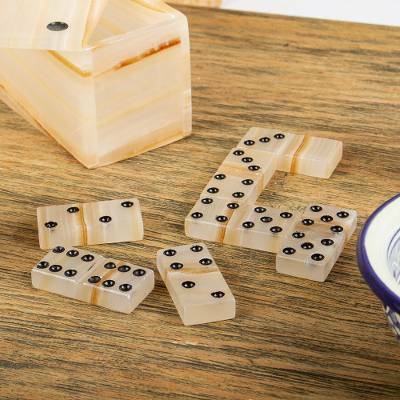 Beige Onyx Domino Set from Mexico, "Never Lose"
The game that blends chance and skill in exciting ways, dominoes make a fun and decorative addition to your home with this set from Mexico. The talented artisans of the Sierra Family work with natural beige and ivory onyx to create this set. Crafted by hand, each piece arrives within a complementary storage box shaped like a large domino. Please note: As the opacity of the onyx may vary, the dots on the domino faces may be visible from the back.